The three held a press conference, criticising the government for letting the "hard-line anti-EU awkward squad" take over the party. The PM said she was "saddened", but her party would "always offer... decent, moderate and patriotic politics". 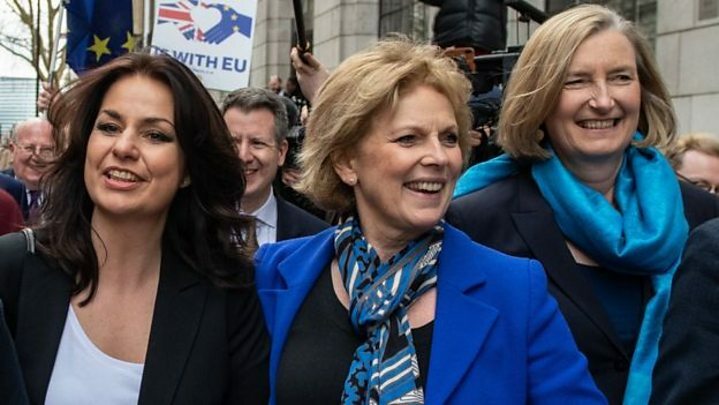 The pro-Remain trio will join the new Independent Group - made up of eight Labour MPs who resigned from their party over its handling of Brexit and anti-Semitism - saying it represented "the centre ground of British politics". Minor tremor or political earthquake? What does it feel like to quit a party? 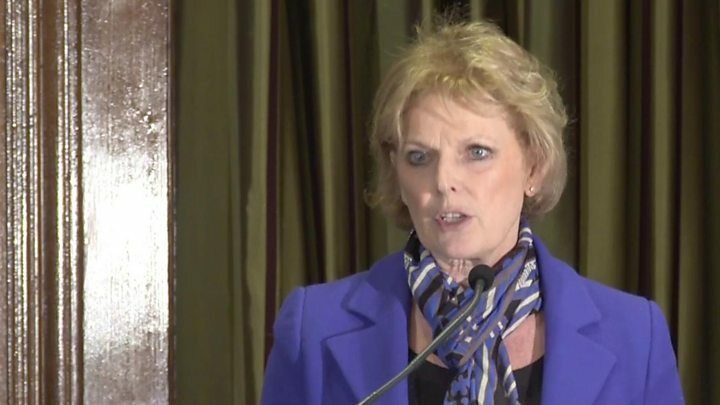 At a press conference on Wednesday, Ms Soubry criticised Theresa May for being "in the grip" of the Democratic Unionist Party and the pro-Leave European Research Group, and allowing Brexit to "define and shape" the Conservative Party. She said: "The battle is over, the other side has won. "The right wing, the hard-line anti-EU awkward squad that have destroyed every leader for the last 40 years are now running the Conservative Party from top to toe. They are the Conservative Party." Ms Wollaston said she felt "great sadness" at quitting the party, but said Mrs May "simply hasn't delivered on the pledge she made on the steps of Downing Street to tackle the burning injustices in our society". And Ms Allen highlighted her concerns around poverty, as well as Brexit, saying: "I can no longer represent a government and a party who can't open its eyes to the suffering endured by the most vulnerable in society - suffering which we have deepened whilst having the power to fix." The three MPs said they will support the government on areas such as the economy, security and improvements to public services, and Ms Soubry defended the record of the coalition government - including the "necessary" austerity measures taken by chancellor George Osborne. But they felt "honour bound to put our constituents' and country's interests first" over Brexit. Watched by the eight other members of The Independent Group on the front row at the press conference, Ms Allen said she was "excited" about the future, adding: "I want to be part of something better, a party that people vote for because they want to, not because they feel they have to." Media captionHeidi Allen: "We have deepened suffering, when it was within our power to fix it"
The departure of the three MPs - who all support the People's Vote campaign for another EU referendum - has reduced the government's working majority to nine MPs, and Ms Allen claimed there were "absolutely" other colleagues "keen" to join the group. And the Independent Group now has more MPs in Parliament than the Democratic Unionist Party and equals the number of Liberal Democrats. Could this new group reshape political tribes? Today's departures are evidence of how serious Conservative divisions have become. Right now, as with Labour, it's a splinter, not a split. But don't underestimate how hard a decision it is for any MP to abandon their tribe. These departures illustrate, therefore, a real problem for the governing party. Like Labour, the Tories have big questions they can't answer at the moment - profound quandaries that it's not clear their leaderships are ready, or perhaps even capable right now of meeting. Mrs May said the UK's membership of the EU had been "a source of disagreement both in our party and our country for a long time", so "ending that membership after four decades was never going to be easy". But, she added: "By delivering on our manifesto commitment and implementing the decision of the British people we are doing the right thing for our country." Media captionAnna Soubry tells Newsnight's Kirsty Wark she was "worried" the prime minister had a problem with immigration. Former Prime Minister David Cameron said he respected the decision of the three MPs, but disagreed with them, calling for "strong voices at every level of the party calling for modern, compassionate Conservatism." Mr Cameron added: "Our party has long been able to contain different views on Europe. Everyone must ensure that can continue to be the case." A Labour spokesman criticised The Independent Group, saying they had formed "what is effectively an establishment coalition based on the failed and rejected policies of the past", such as austerity, corporate tax cuts and privatisation. But Liberal Democrat leader Sir Vince Cable said his party would "hold out the hand of friendship" to the group and said they already had "a good working relationship" with the MPs. The Conservative party's deputy chairman, Tory MP James Cleverly, told BBC Radio 5 Live that the resignations were "very sad and disappointing", which was echoed by Communities Secretary James Brokenshire. But he added that the focus "has to remain on delivering Brexit" and the Conservative party was "a broad church and will remain so". Work and Pensions Secretary Amber Rudd said it was a "great shame to have lost the commitment and undeniable talent" of the three MPs. Remain-backing Tory MP Nicky Morgan said the party "should regret losing three such talented women from the Conservative Party". Former Cabinet office minister, Damian Green, tweeted that he hoped the three MPs rejoined the party one day. Some Labour MPs have been criticising their former colleagues for joining forces with ex-Conservatives. Shadow education secretary Angela Rayner said it was "a new low" to see the MP of her home town, Ann Coffey, welcoming an MP responsible for government cuts, adding: "I'm utterly disgusted." Scottish Labour MP Danielle Rowley also questioned her former colleagues, tweeting: "How people who once called themselves Labour can cosy up next to the likes of Soubry, smiling and laughing, is absolutely beyond me. "I guess we now know how their policies and values differ from Labour." Others have been criticising the group for not holding by-elections to win back their seats as independent MPs. Douglas Carswell, who resigned from the Conservatives to join UKIP in 2014, tweeted: "When I changed parties it didn't occur to me to not hold a by election. If my own electorate weren't supportive, what was the point?" However, Ms Allen rejected calls for them to step down to contest by-elections, saying: "This is what the big parties do. They want to crush the birth of democracy. They want to crush people like us trying to change things for this country. "This is the game, of course, they will play but we are better than that, and we think our constituents and the country deserve better than that."